The Good Fight: After its boozy and fun season 2 premiere, the show settles back into its normal rhythm in the second episode of the season, “Day 415.” Not only that, but it dives head first into its least engaging storyline: Maia and her family’s legal problems. Grade: B-. 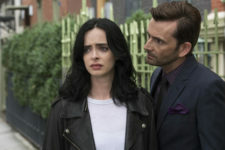 Jessica Jones (pictured): David Tennant made his long-awaited return to Jessica Jones in episode 11. However, this isn’t silly fan service or proof that the show, like so many other superhero properties, can’t let go of a great villain. Grade: A-. The Walking Dead: The Saviors are out in full force. After receiving another impulsive call from Rick, Negan wants to know what happened to all those Alexandrians who magically vanished during their fire-bombing assault. Grade: C.